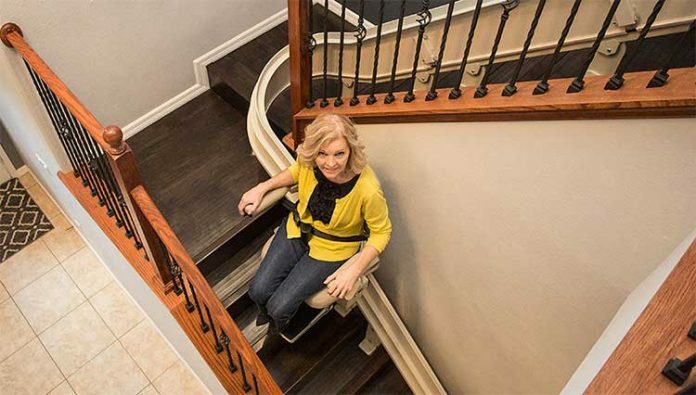 The Bruno Elite is a curved indoor stairlift custom-made for your home. A stairlift is essential for moving up and down a story house especially for ageing or physically challenged homeowners. The Bruno Elite Indoor Curved stairlift is the best option to help you move from one area of the house to the other. It supports up to 181kg. The stairlift has a comfortable seat pad measuring 21.5 inches wide by 16 inches deep. Its seat is an offset swivel to ensure maximum comfort when getting on and off. The footrest is 12 inches long and 11 inches wide to provide a larger surface area for your feet. The arms of the chair can fold upwards to allow for more room and easy access when getting on/off. Park options vary with the kind of staircase the client has. The lift could either be parked at the top or bottom positions of the staircase and is designed to extend the rails away from the stairs for added safety. The stairlift is equipped with a mid-park and charge station option to allow access to middle floors. The chair can be customized to different upholstery, six different colors and multiple fabrics to be made hence satisfying the client with different preferences. The Bruno Elite Indoor Curved stairlift has some technological add-on that brings more satisfaction to the user. One could either choose to have the chair’s control mounted on the chair arm or operated wirelessly. The footrest is automatic in that when the seat is not in use and folded up, the footrest flips up and when folded down it flips down. In the case of power outages, the chair has two dependable 12-volt batteries that charge at the top and bottom of the staircase ensuring the chair does not get stuck midway. An optional charge preference is enabled for mid-park options. The chair is of luxury status and dependable. It is customizable to fit user preferences and puts a lot of emphasis on safety.